Catering to your inner nutritionista. 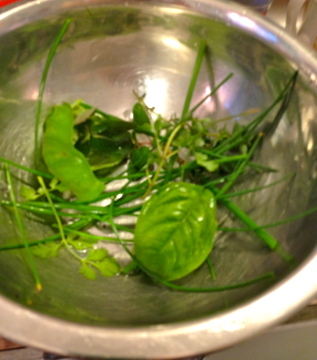 A little herbal inspiration from the burgeoning herb garden inspired to this simple delicious and healthy quickie dinner. 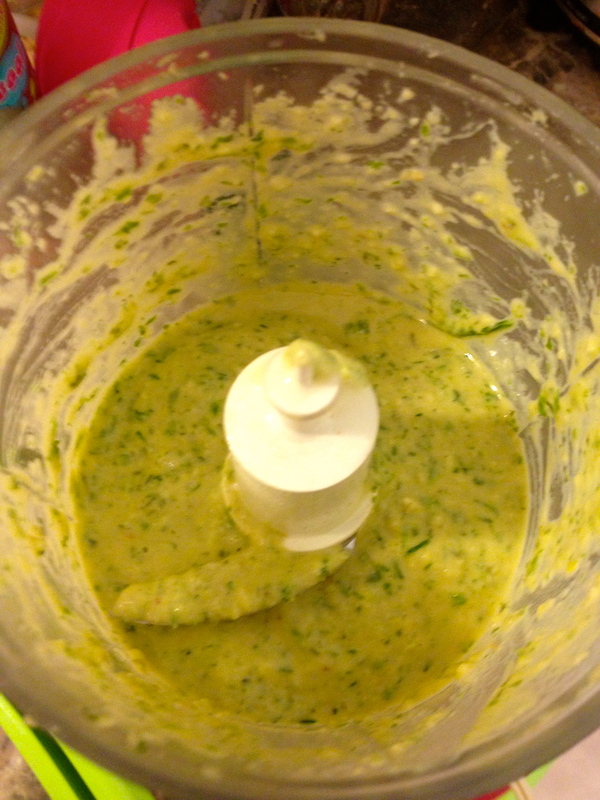 Grabbed some chives, basil, thyme, parsley and/or cilantro and pulsed it altogether with s little bit of dijon mustard and a little bit of lime juice with a splash of sesame oil in the mini Cuisinart. 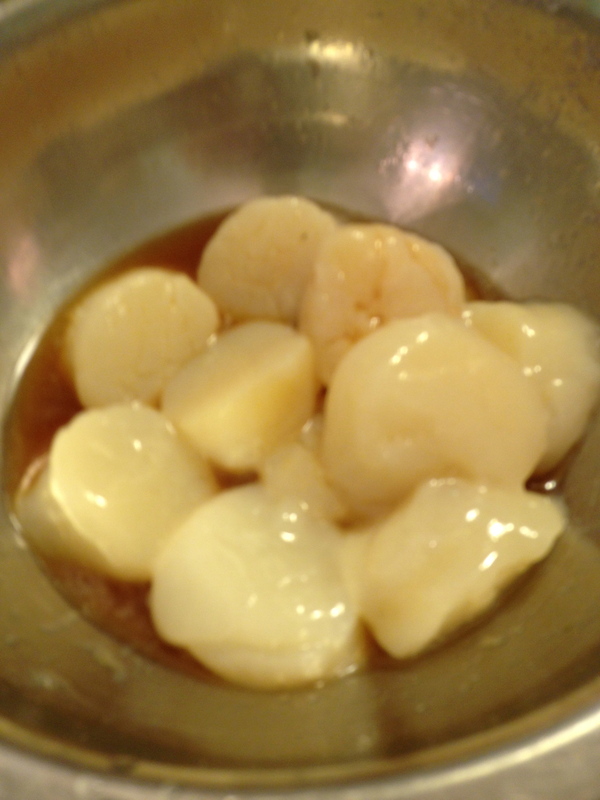 I had some scallops, not so much fresh as recently purchased in one of those shrink wrap packages from the local Korean grocery store, and maybe hanging out in my fridge just a little too long…They smelled okay though, so onward and upwards. Made a quick marinade of sesame oil, lime juice, ginger and garlic and let the scallops hang out in there for a few minutes. Prior to starting the saute, also cut up some veggies as a nice accompaniment to the scallops. Peppers, onions, zucchinis, nice round circle cuts to imitate a “pasta” side dish. 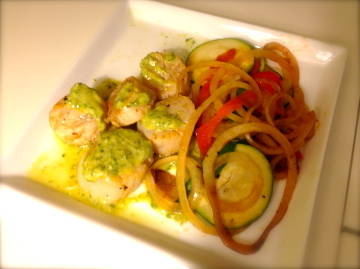 After a 3-5 minute saute of the scallops, plated with a drizzle of some herbal pesto and side of veggies, totally delicious and satisfying. Finished product is high in protein, low in calories and off the charts in taste. I am a registered dietitian (RD) and a certified dietitian nutritionist (CDN) with a Master’s degree in Clinical Nutrition from New York University. I’m also a self-professed food geek with a keen interest in providing the most honest and factual information about diet and nutrition that I can. This blog features lots of my recipe “experiments.” My attempts at making healthy versions of foods that might be traditionally high in fat or calories. I'm also a big fan of fruits and vegetables and the various health benefits than can be achieved by consuming them. Check back frequently for the most up to date information on health and nutrition. I am always looking for inspiration, so please email me your questions and I will be happy to feature them on Fashionably Healthy. My Life Journey, unscripted and unrated… laughter, tears and everything in between!